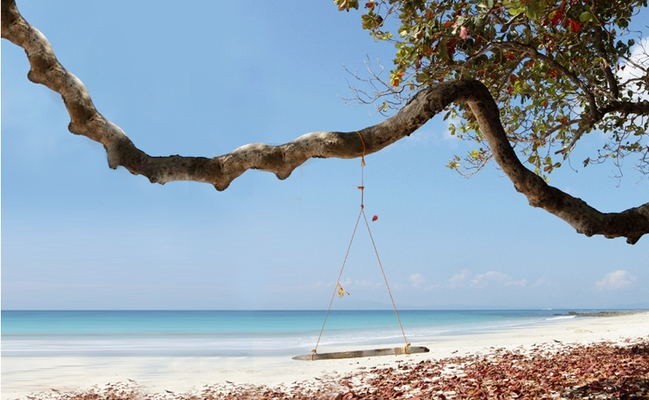 Planning your next trip to the Andamans just got a little bit easier. A new Taj Exotica Resort and Spa has recently opened at Radhanagar beach. Leading South Asia-based hospitality company, Indian Hotels Company Limited recently announced that it has opened a world-class resort at the crescent-shaped beach. The resort is enveloped in a natural habitat in a way that it creates a minimal footprint on the fragile ecosystem. Built over 46 acres, it is a promising hideaway to a significant biodiversity space in the Bay of Bengal. It is surrounded by a thick cover of mangroves; no tree was felled during the construction and it overlooks a melange of unspoilt beaches, rainforests, national parks and wildlife sanctuaries. The villas have been designed in the shape of pitch-roof stilted huts, paying homage to the style of the indigenous Jarawa tribe. Taj has its own water bottling plant, biogas facility, a reservoir for rainwater harvesting and partial solar energy, and has also collaborated with the island’s Pollution Control Board to keep plastic away from the area. There is a fitness centre built around a majestic Mahua tree. In the evenings you can lounge around the water lily pond or rest by a Padauk tree after a relaxing massage. There are quiet spaces within the resort where you can retreat amidst the subtle chirping of kingfishers and emerald doves. Kids can go picking mangoes, mulberries, and apples at the bountiful orchards nearby. Other fun activities include jungle treks, beach picnics, supervised scuba diving and shell-craft lessons that will keep you engaged in the marine and terrestrial ecology of the island. If you are feeling a bit more adventurous there is plenty you can do — indulge in game fishing, night kayaking in the mangroves, or take part in turtle nesting excursions. The resort’s three concept restaurants – Turtle House, Shoreline, and The Settlers will help you dive into the depths of the local flavours and enjoy a fine dining experience. The Taj Group has played a significant role in putting India on the luxury travel map. Its hotels in exotic places such as Rajasthan, Kerala and Goa offer unparalleled service and comfort, attracting guests from all over the world. Its entry to the Andaman & Nicobar Islands though is being seen as a game changer. The place has remained majorly untouched by commercial tourism. Thanks to a government initiative to encourage tourism, capital Port Blair is now connected by flights to major Indian cities, including the nearest — Chennai. Three ferry services link the port with the main tourist island, Havelock. The Taj is the first luxury resort to open on this island, reputed to be one of the best beaches in Asia. A walk around the island will make it amply clear why the government has been slow to throw open up this part of the country to tourists. This virgin wonder is home to rare tropical greens. There are acres of plantations of areca nut palms, golden fruit, and the omnipresent coconut trees and rice paddies. Add to this, pristine beaches and wildlife and the Andamans clearly become one of the top places to travel in 2018. A major part of the island cluster is protected for forests and native tribes and is not accessible to tourists. Tribal houses can be seen from afar when you are on the road but you won’t be allowed to disturb or mingle with the locals. The area is also protected for strategic reasons because of army and naval bases protecting the Malacca Straits. Of the total 572 islands, only 38 are inhabited and you will be allowed to visit only a handful after getting a permit. Remember to check the weather forecast before you fly because unexpected rains often cause delays in ferry and flight services. Avoid the June to September monsoon season completely. A special inaugural rate of Rs 25,000+ taxes (including a poolside breakfast) is on for two adults.